How the Robertson Trust's scholarship programme helps students from disadvantaged backgrounds into successful graduate careers. In late August when all new students are confirming their university places or engaging with the challenges of Clearing, 150 or so new students are also busy confirming their places on The Robertson Trust’s Journey to Success programme and embarking on a supported pathway that will, we hope, end in a successful graduate career. The Trust has been providing scholarships for students from disadvantaged backgrounds since the 1990s. However, over the years it became apparent that funding alone was not sufficient to overcome the challenges that those students face in completing their degree successfully and obtaining jobs that allow them to fulfil their potential. To address this we have developed the Journey to Success programme. At the heart of the programme is a bursary of £4000 a year (if the student lives away from home, £2800 if they live at home), but this is very much just the underpinning of our wider package of support. The generous support of a number of our university partners in match-funding the bursary has allowed us to expand our numbers over the past few years, and we now support around 650 Scholars at any one time. The key to our programme is the development of skills that will support our Scholars in their future careers. These include self-awareness, resilience, networking, applying for jobs, communication skills and personal branding. 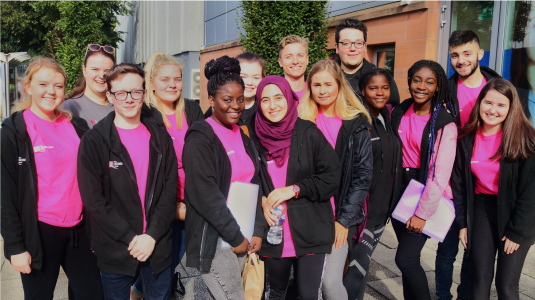 We also aim to provide the kind of support that other students may obtain from family and personal connections, such as introductions to potential employers, access to business mentors, and advice and guidance on career choices. 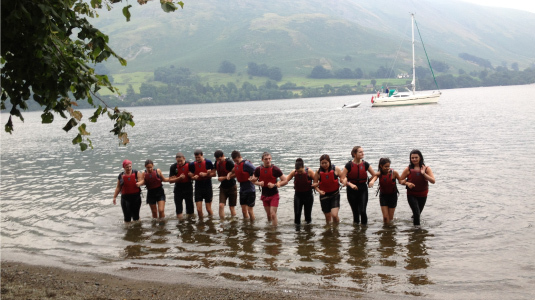 The programme begins with a residential weekend in late August, run by the Outward Bound Trust in the Lake District. The outward bound activities are really secondary to bringing the Scholars together in their university groups and linking them with their ‘Ambassador’ – a second year Scholar who provides them with peer mentoring and support and also organises social activities and charity fundraising through the year (with the Trust matching what they raise). It’s also an opportunity for them to get to know the Trust team and learn about the programme and how they can get the most from it. Once the Scholars are installed at their university the programme begins in earnest, with two skills workshops a year from our team, and an annual gathering at which we share success stories and promote the additional awards and opportunities that Scholars are offered. Over the coming years this will include a range of career pathways being developed with employers for specific sectors such as banking and international development. These will consist of internships and mentoring to support the Scholar towards a particular career. This is in addition to our base commitment to sourcing and funding an internship for every Scholar, usually in the summer after their third year. For Scholars with leadership potential there is the chance to become an Ambassador, work with other Scholars, take part in additional outward bound activities and, for the most successful, to participate in the Sir Ian Good Leadership Award in their final year. This award provides mentoring from a leading member of the profession the Scholar wishes to follow, as well as additional training in public speaking and attendance at a series of dinners with business leaders. Finally, we also support the Scholars in undertaking volunteering placements and provide funding for self-development awards for Scholars who wish to undertake a particular activity. In recent years this has included working on a hospital ship on Lake Tanzania and developing British Sign Language (BSL) signs for scientific terms. At the end of their course, 90% of our Scholars obtain a first or a 2:1 and most will go on to employment in a graduate job or further study. We provide support for their job-seeking by helping with CVs and interview practice and, of course, with professional contacts. Our Scholars are recommended to us by their school or university and there is a competitive application process. We do not accept direct applications from individual students. In all this, our aim is to give students from disadvantaged backgrounds the support and guidance that will help them to overcome the barriers they face in fulfilling their potential. We can’t, unfortunately, help everyone and so we are also working with partners in the sector to support the widening access work that will enable all students to have an equal chance of success, and I’ll cover that in a future blog. For more information about the Trust or our application process, please go to The Robertson Trust's website.